Summer adventures are always better with craft beer, and Anchor brews in cans make the the perfect traveling companion. Whether you’re at the beach, in the mountains, on a boat, or at a barbecue in your own backyard, Anchor cans are a convenient way to Raise Your Anchor in the great outdoors. 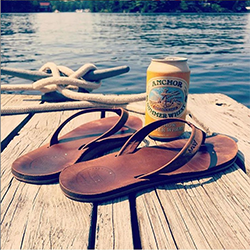 We’re celebrating the sunny days of summer with a chance to win Anchor gear! Capture a photo of your summer adventure with an Anchor brew in a can and tag it with #MyAnchorCan on Instagram now through August 16, 2015 to enter it in our #MyAnchorCan Summer Photo Contest! 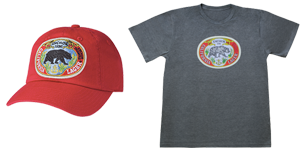 After all of the entries are in, our panel of judges will choose three winners to receive Anchor apparel and glassware from our Steamgear store. 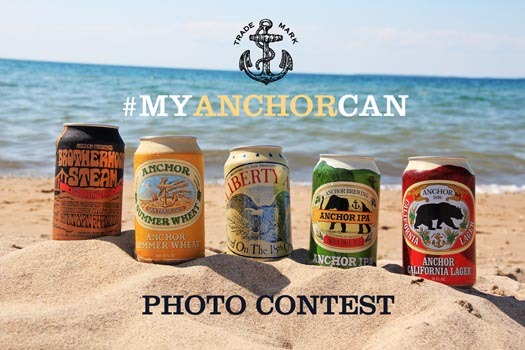 The My Anchor Can Photo Contest is open to residents of the United States who are at least 21 years of age and are following the @AnchorBrewing Instagram account. Entries will be allowed from Friday, July 24, 2015 through Sunday, August 16 at midnight. Photos must be created and owned by you, and may not be associated with any other promotion. By submitting your photo, you agree to its use by Anchor Brewing Company for display and promotional purposes. Enter as often as you like. At the conclusion of the contest on August 16, a panel of judges at Anchor Brewing Company will select the winners of the Grand Prize, Second Prize, and Third Prize. Entries are at the sole discretion of Anchor Brewing Company and may be refused if content is determined to be inappropriate. By submitting a photo, you agree that your photo and/or your name may displayed on the Anchor Brewing website and other digital media, and may be used for promotional purposes, at any time, without any fee or other form of compensation. We reserve the right to disqualify users, without notice, and for any reason.